Joseph Lindsay Joyce, age 68 of 140 Randolph Street, Bennett, passed away July 25, 2011 in Bennett . A native of Randolph County, he was the son of the late Andrew J. and Cloyce Brady Joyce. He was a 1962 graduate of Gupton-Jones Mortuary College in Dallas, TX. In 1972 he opened what is now Joyce- Brady Chapel. He dedicated his life to funeral service with over 50 years of service. 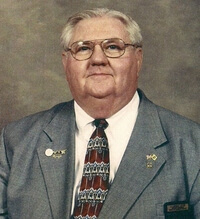 He was a lifetime member of the Marietta Lodge #0444 in Ramseur and was a 33 degree Mason; was a member of the Bennett Fire Department for over 18 years and was a charter member of the Tri-County Ruritan Club where he held most every office including District Zone Governor in 2004. He is survived by: his wife of 48 years Ollie Logsdon Joyce of the home; daughters Kim J. Mounce and husband Danny of Mebane, Kellie J. Garcia and husband Dennis of Asheboro; brother Larry Joyce and wife Betty Ann of Bennett, Laverne Joyce of Fayetteville; granddaughter Faith Rose Mounce of Mebane; grandson Chris Garcia of Colorado.